The light and compact ultrasonic wall thickness gauge SONOWALL 50 enables the precise measurement of the wall thickness of components made of metal, glass, ceramics and plastics. This efficient device allows the measurement of materials with both flat and curved surfaces. The wall thickness gauge enables the quick and simple detection of the first signs of wear and corrosion, for example, on ships, storage tanks, pipelines and cranes etc. The SONOWALL 50 is characterised by its stable data readout and broad measuring range. 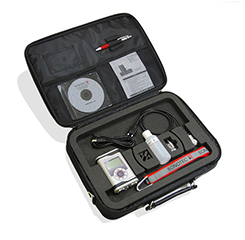 The integrated data logger makes this user-friendly device a powerful and efficient all-rounder for practical use in numerous applications. In addition to the robust aluminium housing and the use of the highest quality components and materials, the SONOWALL 50 also has a practical ergonomic design. The SONOSCAN probe SW 5-22 for the SONOWALL 50 has been specifically designed for the measurement of wall thicknesses of pipes with small diameters. The integrated guidance system guarantees the stable coupling at curved pipe surfaces.